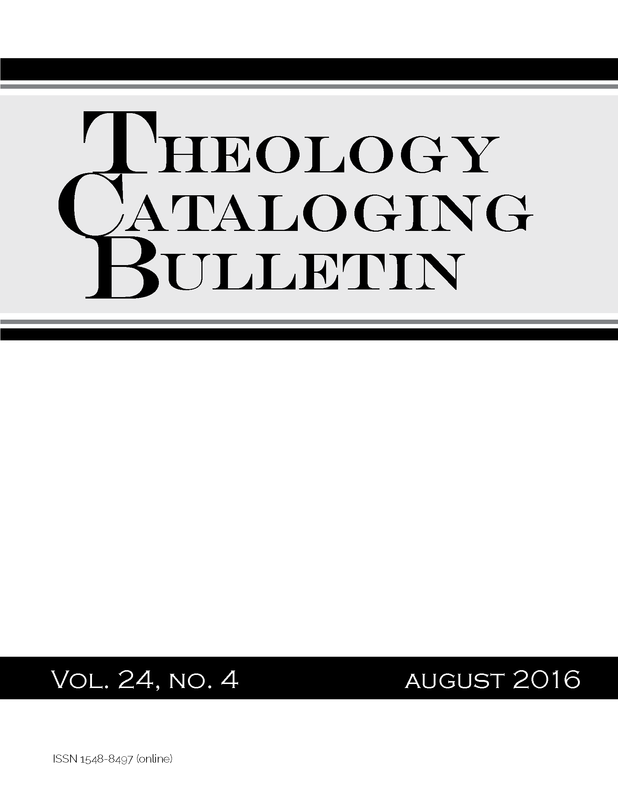 The August 2016 issue of Theology Cataloging Bulletin (TCB), a benefit of membership, is now available. Please click here to access this issue in the member restricted section of the ATLA website. Section one of each issue lists new and changed subject headings and genre/form terms and section two lists new and changed classifications. Both are selected and compiled by Ann Heinrichs (Catholic Theological Union, Chicago, Illinois). Section three includes general information, including professional development opportunities, and is edited by Leslie Engelson (Murray State University, Murray, Kentucky). Arthur (AJ) Boston, Scholarly Communication Librarian, Waterfield Library, Murray State University, submitted a testimony, Personal Collection Development. Thank you to the Technical Services Interest Group (TSIG) for their work on this publication. Click here to access the Member’s Only publication.